HOUSTON, Feb. 21, 2019 /PRNewswire/ -- Moody National Companies is excited to announce the opening of the Residence Inn by Marriott in the Texas Medical Center in Houston, TX. This beautiful 16-story, 182-room hotel is located at 7807 Kirby Drive, which is an ideal location to serve the Texas Medical Center and NRG Stadium. The Residence Inn includes a 4.5-story parking garage along with four private meeting spaces totaling 5,000 square feet. Moody National Hospitality Management will manage the daily operations of the hotel. Brett Moody, Chairman and CEO of Moody National Companies, said, "We are very pleased to bring the Marriott Residence Inn to the Texas Medical Center. We are providing the premier extended stay hotel brand to the largest medical center in the world. The continued growth at the Texas Medical Center creates an unparalleled opportunity to serve the local market by meeting the need for more extended stay rooms. We were blessed to work with a great team on this project, including the general contractor, ArchCon; the construction manager, Mathis Group; and Moody National Hospitality Management. As a result of these market experts working together seamlessly, we were able to open the hotel ahead of schedule and under budget." 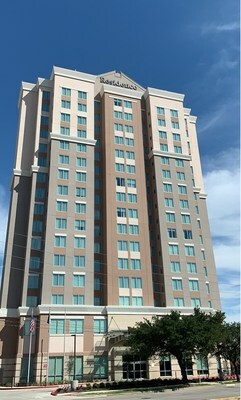 The Residence Inn is located in an area that generates a high demand for extended stay hotels. As the largest medical complex in the world, the Texas Medical Center is home to the world's largest children's hospital and cancer center. The Texas Medical Center houses 45 collaborating institutions and sees more than 10 million patients per year. It is the 8th largest business district in the United States and covers 50 million developed square feet. Opening up in time for the Houston Livestock Show and Rodeo, the Residence Inn is also located adjacent to NRG Stadium, home to the Stock Show and Rodeo and Houston Texans. Over a span of almost 3 weeks, the Houston Livestock Show and Rodeo consistently sees on average 2.5 million people annually. NRG Stadium has the capacity to host up to 72,000 people for Houston Texan Football Games and hosts over 500 events per year, such as U2 concerts and the NCAA March Madness Tournament. Moody National Hospitality Management has operated approximately 80 hotels totaling 10,000 rooms across the nation. In Houston, Moody developed the Marriott Courtyard in the Medical Center in 2010, and currently owns and operates the Homewood Suites in the Woodlands and Hampton Inn Energy Corridor.